Here I am 24 hours after having broken my foot. Quite simply achieved by rolling my ankle down a kerb in the dark at 6.15 in the morning. I would have soldiered on to work but my wife suggested I should stay at home and within a couple of minutes I was inclined to agree, feeling somewhat unwell. I have learnt over the years to look after myself. I always know where my finger repair kit is ( an old shoebox with all the plasters, tapes, finger dollies and everything else you would need to repair cut and damaged fingers). 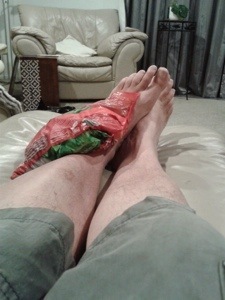 Since my butler is currently on leave, I settled down with my foot raised, an ice-pack (in the form of frozen peas) on my ballooning ankle, and some ibuprofen down my throat to tackle the pain systemically and reduce some of the inflammation. A thorough examination by my GP gave rise to a visit to the local X-ray department. When the doctor said “Come and have a look at your X-rays.”, I knew it was not going to be the news I wanted to hear. 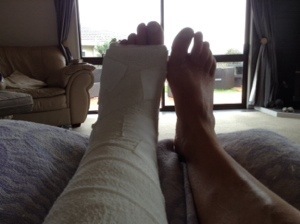 A plaster cast, crutches, and no weight-bearing on my left foot were going to be my sentence for the next 10 days. A discussion with Gwyneth about how I would tackle shaving and washing on the first morning gave rise to her suggestion that I should take a height-adjustable swivelling bar stool into the bathroom. I had already decided that I would have a strip wash each day. 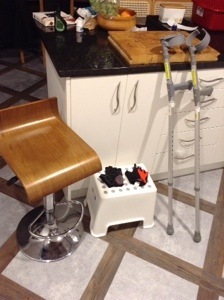 The stool reduces the danger of falling over and a child’s hop-up is a good way of steadying myself when I am standing on my good leg without the risk of me putting any weight on the broken foot. Take it easy the first few days. Keep the crutches close in to your body and close to vertical. Your hands will get sore. Get some cycling gloves to relieve the pressure. Going upstairs start with the crutches next to your feet, push your body up and lift your good foot up one step in a smooth motion with your bad leg trailing behind. Coming downstairs start with the crutches one step below you, bad foot out in front and support your body weight as you transfer your good foot down one step. Turned a corner today. The swelling (and consequently pain) went down overnight. I’ve been told to support my leg on pillows at night but the bedding was too heavy (or tight) and I’ll need to find a better arrangement tonight. I could go stir crazy sitting around all the time and so I took myself off shopping in the late morning. In the supermarket I asked for a carrier bag so I could sling it over the handle of the crutch. At the green grocer’s they carried everything out to the car for me, including a sack of potatoes. I sat in the afternoon sunshine, reading although I had to change the setup on my Kindle app so I could read the words in the bright light.